As an ultimate frisbee player, I get exposed under the sun a lot. Tournaments are usually held on Sundays, and games begin as early as 8am. Most of the time, my games get scheduled between 10am and 2pm where the sun is at its peak and can be very bad for my skin. This is why applying sunblock is very important to me, and has become part of my daily ritual. Everyday, I apply sunblock right before leaving the house for work. But on Sundays, when I’m under the heat of the sun the entire day, I apply sunblock before and after every game. That’s usually four times in a day. To keep my skin protected, I wear long-sleeved compression shirts and tights to cover my arms and legs. I make sure my hands are clean before putting on some sunblock to protect my face. I’m very particular about the brands of sunblock I use, and I always make sure it’s approved by my dermatologist and has a strong enough SPF. I’ve been a loyal fan of Neutrogena’s products ever since. Aside from their Deep Clean facial wash, I also use their Ultra Sheer Dry Touch sunblock. Since the release of the Bridal Bliss Box and I read one of the labels: “Neutrogena UV Moisture Sunblock SPF 50,” I immediately packed it inside my sports bag and told myself I would use it on my next tournament day. And use it, I did. I applied it as soon as I arrived on the field. Like the Ultra Sheer Dry Touch sunblock, the UV Moisture doesn’t feel sticky or heavy on the face. The light scent doesn’t leave the nose irritated, and it’s gentle on the eyes. (When I sweat, sunblock tends to go to my eyes). Best of all, it comes in a small and convenient bottle that’s easy to carry around or take with me to the field. It sounds strange, but it makes putting on or reapplying sunblock more exciting! It’s the perfect sunblock for daily use. Because the consistency doesn’t leave the face oily or shiny, you don’t have to worry about going out looking like you didn’t wash your face. 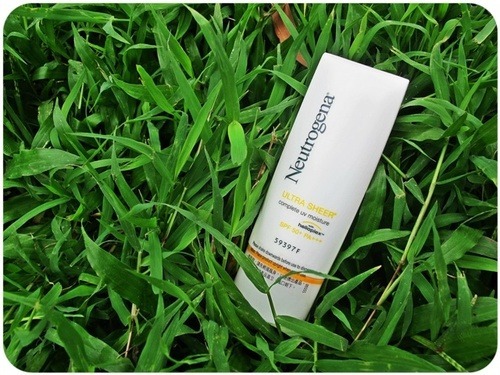 Prevent early signs of aging, uneven texture and skin tone, and roughness with Neutrogena UV Moisture Sunblock SPF 50, available in every Bridal Bliss Box.